Our Men's Lakemont Half Zip features Linked seams, attractive colors to create customized product for your events. Attract your potential customers towards your brand with an impressive promotional gift that represents the quality you offer! Cutter & Buck Men’s Lakemont Half Zip is a value priced solution that allows customization using your brand logo for maximum visibility of your business. This full sleeves men’s sweater is made from a special blend of cotton, spandex and nylon in the right proportions to offer ultra-soft warmth and weather protection in any season. 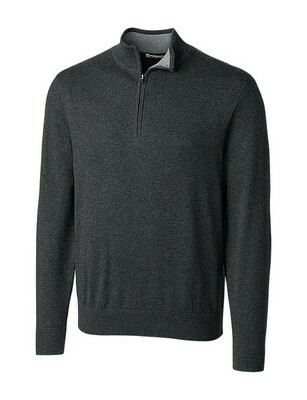 With three classic color options, this sweater offers versatile styling for modern guys. Mock neck with chin guard and half zip offer comfortable protection against wind while rib layer at cuffs and collar add to the look. Contrast color at inside neck and cuffs and English shoulders further enhance its stylish appearance. Book your order for this budget friendly promotional gift item today!